so one major change since taking photos for this post is.... i've chopped my hair off! now i already liked my hair don't get me wrong but as i'm naturally really straight it was so limp i could never wear it. which meant i had to curl my hair everytime i wanted to wear it down. in other words, i'm too lazy for that. so i've let the hairdresser take about 3 inches off so its a little just past my shoulders. i'm still undecided to how much i like it... i don't hate it though! i think it's more because i need to learn a whole new way of styling it because it's short. meaning after work today i'll have a look at laura from tiny twists youtube vid on it! anyway hope you like the outfit, it's a little bold and i did get quite a few stares but i wanted to go all out to bring the trousers to life! hope you all have great easter plans. i'm unfortunately at work today and tomorrow (starting a 7 - eugh) as i work in the wonderful realms of retail. even so i hope everyone else has a great time and stuffs there face with loads of choc! i'm just counting down the hours until i have fish and chips tonight. mmmm. Love the jacket! It's a gorgeous shape, and I love the panel details. oh wowser girl you look amazing! 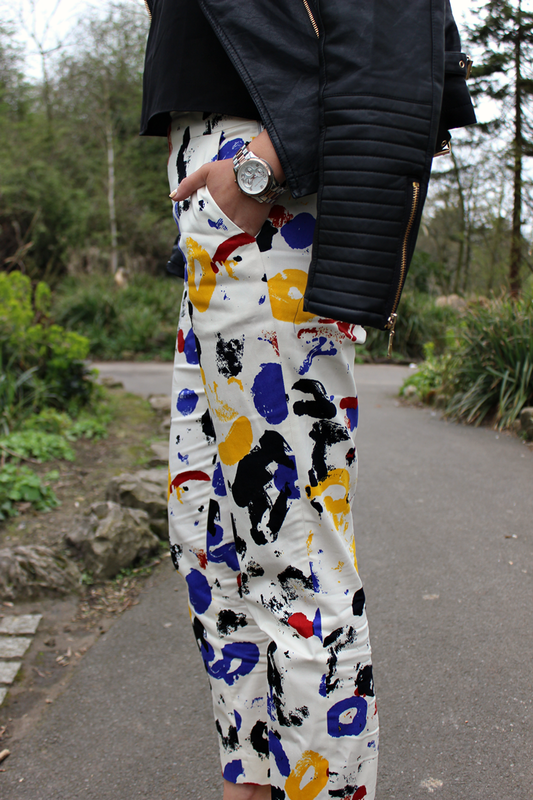 Those trousers are seriously incredible! Love the colour of the shoes and they really bring out the best in the trousers. I love this outfit so much, the heels were a good choice! Those trousers are just amazing! These trousers are absolutely gorgeous and you look amazing! 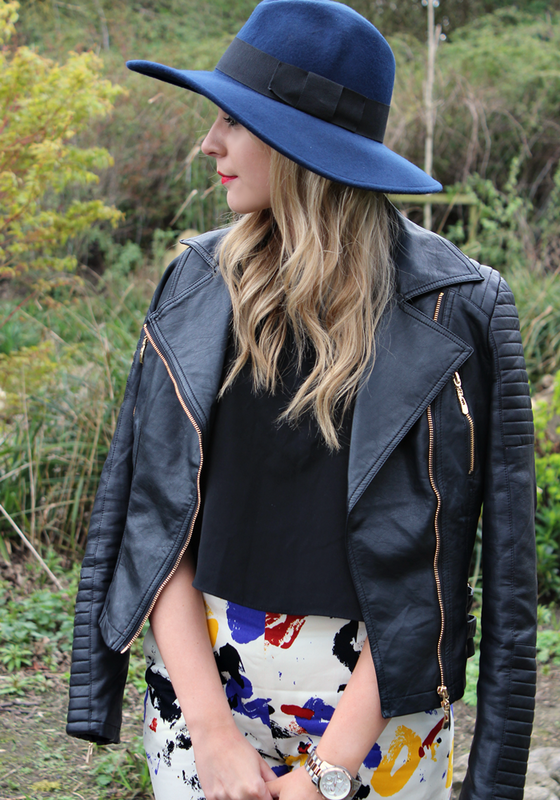 I love your hat, shoes and leather jacket! Really nice color combination. Perfect hair and makeup too for the whole outfit. I love this look on you! I love the simplicity of this outfit. What a beautiful dress .Thanks for sharing a beautiful and high quality Jacket.everything looks so comfy! Love this outfit! Saw those trousers on This Morning the other day and really liked them. Going well with that whole art student trend thing. Anyway, love this outfit, as always! those trousers and heels are so cute, love them!